After days of seeing this movie being promoted in the social media, I was obviously thinking that I should give this one a try. At first I was really doubtful as I had to see this movie by myself since (you got it! ), my wife would not want to see this kind of scary film. But today my wife and I had some free time in the afternoon and I thought why don't I see it by myself? There must be some other people in the cinema to "accompany" me. And there I was, at almost 1 PM, waiting for the movie to start and surrounded by quite a lot audience which relaxed me a bit. Well let us get move on to the movie now. Story started with the death of the mother of Annie (Toni Collette - The Sixth Sense, About a Boy etc) who worked as a miniaturist and had her own workshop at her house. Annie's husband Steve (Gabriel Byrne - All Things to All Men, In Treatment TV series etc), their teenage son Peter (Alex Wolff - Jumanji: Welcome to the Jungle, Patriots Day etc) and his 13 year old sister Charlie (Milly Shapiro) who loved to draw, were all dealing with the grief in their own ways. But the most affected one seemed to be Charlie as she was the closest with her grandmother. In order to deal with her loss, Annie went to a support group for people who had lost their loved ones. That was when she met with an old lady named Joan (Ann Dowd - Compliance, The Leftovers TV series etc) who just lost people close to her and shared the same grief as well. When the family was hit with another incident, things started to really fall apart for everyone. Especially when strange unexplainable things also started to occur to them. So could they all survive it? Find them all in this different kind of horror movie. OK so this movie was supposed to be the scariest movie of 2018 and all those great things said by the critics. Was it true? Did it scare us crazy? Hmmmm well I think the answer would be Yes and No. Why yes? There were indeed some scary sh*ts in the final third of the movie when the supernatural event started to happen. The earlier part was the build up towards the important story which (do not get me wrong), was actually pretty good in term of drama. But heck, when you read all those reviews, I was under the impression that we would be scared from start to finish. And that was the part where it did not make us scared but more like concerned or even feel pity towards Annie's character. Toni Collette indeed was very good in her performance. She was truly wonderful in portraying the rather disturbed, having a little bit mental problem kind of woman/mother. And her expressions whenever she was scared were really great. We could feel the horror from the look in her eyes. Plus do not forget the performance of Alex Wolff who was also superb (though sometimes it was a little bit irritating to see a teenaged boy's behavior like a 10 year old kid). The newcomer Milly Shapiro did give a creepy impression to us as well. I already mentioned above that the movie started to get super scary quite long after the build up. Prior to that there was a scene which I thought would be the start of the horrifying scenes, but apparently it was to further build up! This kind of build up might be suitable for people who appreciate a different kind of horror movie, or the psychological horror movie. But if you watched the trailer, or saw those critics comments, you could not be blamed for thinking differently. And unfortunately, I fell into the category of the casual audience (or the more sophisticated term: mainstream audience) who preferred the supernatural movie like those Conjuring series. I am kind of surprised to read the movie being compared to film like The Exorcist which I think had very little similarity. And the ending of this movie, though could be understood from the plot point of view, did not really impress me. Felt a little bit too weird for my taste. Overall, for a little over 2 hour movie with that kind of build up, especially with different expectation, it became a movie that felt unnecessary long to my opinion. It would have been a better experience if we were warned that this was a more artsy horror movie that might not be to everyone's liking. I think this film should have been classified as drama horror with touches of mystery and perhaps if the critics had not been so bombastic on their reviews, I would probably have been more satisfied. In the end, if you say this movie was the best drama horror movie simply because of Toni Collette's performance, I could agree. Personally though, I think this surely was not the scariest movie. It was probably more suitable to say this was one disturbing different kind of movie by Ari Aster in his directorial debut. 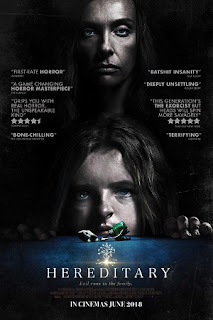 So if you are looking for scary supernatural horror movie because you think this was such film, then be ready for a very slow build up towards a quite scary half hour ending. But if you want to be scared from start to end, then this one definitely would not suit your appetite. The choice is yours.